Local real estate market trends with latest Boulder CO property updates for home buyers and sellers. Can it be a Buyer’s market AND a Seller’s market? For June 2012 the highest # of homes sold was in the $200-299k price range (148) followed by 125 sold in the $300-399k range. Of all of the areas covered, 237 were sold in Boulder and 149 in Longmont. These two areas accounted for 65.1% of the total sales volume for both counties which was $252,929,578 for June 2012. Once again, our beautiful city of Boulder, Colorado has been named the “Happiest City in America“! National Geographic surveyed people across the nation and found that residents of Boulder said they are happier on a scale of one to ten than any other respondents. Many factors contribute to this overall happiness, including quality of life, climate, access to the outdoors, and balanced lives. Of course, this is no surprise to us, but if you are contemplating a move to Boulder or the surrounding areas, contact us! We are here to help. Residents of Boulder, Colorado are used to hearing great press about the wonderful place we live. Over the years we have consistently been ranked in lists such as “Top 10 Places to Live”, “Best Cities for Recession Recovery”, “Top 25 Best Cities for Gen Y’s”, and Forbes’ “America’s Top 25 Towns to Live Well”. Just recently Boulder was voted the #2 College Town by Parents & Colleges.com, and Portfolio.com rated Boulder “America’s Smartest City”. Would you like more information about Boulder, CO and the surrounding areas? At the recent Vectra Bank Business For Breakfast the Colorado economy was the prime topic. One of the state’s leading economists, Dr. Phylis Resnick from the Center for Colorado’s Economic Future, says that we can expect to experience a “new normal” for the time being. This translates to slower growth in most economic variables and slightly higher long-term unemployment rates. The good news is that Americans are saving again, with personal savings rates returning to levels not seen since the 1908’s. Colorado real per capita personal income dipped a little in 2009-2010 but is forecast to see a slow but steady upward climb. The bad news is that there will be a continued gap between Expenditures and Revenues for the State of Colorado with no end in sight. This means our local communities will continue to be challenged to maintain the amenities and services we have been so accustomed to. Approximately every other week Colorado Landmark provides detailed information on the real estate activity in Boulder and Broomfield Counties from the past two weeks. Hopefully our analysis will help reveal what properties are selling, at what prices, how long they are are taking to sell, and other relevant information about what’s going on in OUR local area – Boulder County and Broomfield County. Information obtained from MLS and public record. Each period’s Top Ten numbers continue to point to the potentially fatal ramifications of over-pricing. This period the glass-half-full view is that 5 of the top 10 properties examined sold for 90% or more of their original asking price. 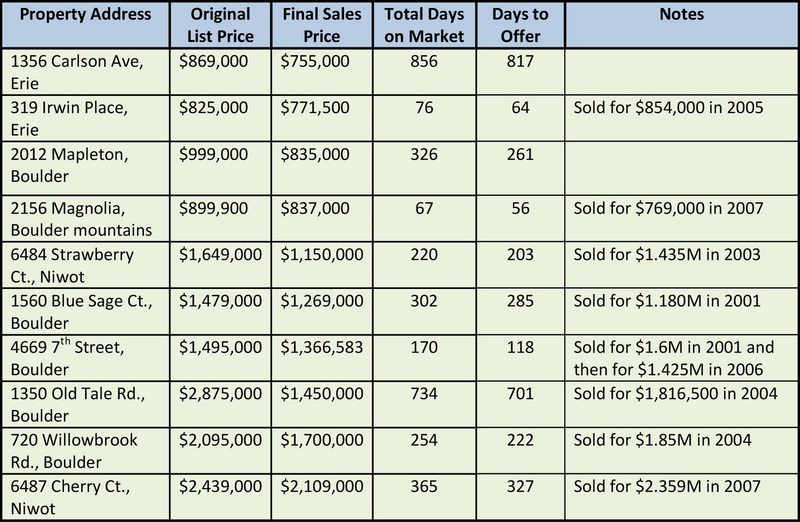 The flip side of that is that the remaining five sold for 77.5% or LESS than their original asking prices. The property on Bellevue Dr. sold for a dismal 56.8% of it’s original 2007 asking price. 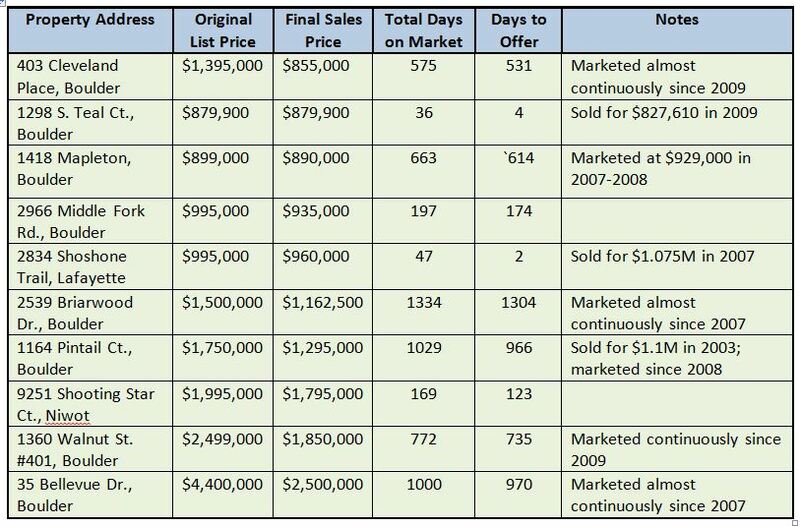 The key here is the 2007 … it took 1000 days for this property to sell. Now we expect that properties of this caliber can take a year or more to sell, but almost 3 years? That’s a total miss on the pricing mark from the get-go. 2539 Briarwood sold for 77.5% of it’s asking price after a ridiculous 1334 days on the market. The other part of the glass-half-full is that only NONE of the above properties sold for less than what the owners paid for it. That is great news! It is impossible to tell if these owners put in any improvements that would have increased their basis significantly, but if not then all of these lucky folks did a little better than break-even. As I said last time, homeowners can’t assume that their housing is going to be a big money-making investment – key word = housing, when it comes down to it that is what your home is. Homeowners also should not be surprised if they encounter a few more realtors out there that are willing to turn down the opportunity to list their house. You know a good realtor when they turn down your listing because you can’t agree with them on price. No amount of marketing and internet exposure can make up for pricing too far beyond what the market can bear. If you are considering listing your home, interview at least 3 realtors. Ask each about their experience selling homes in YOUR SPECIFIC neighborhood. If they don’t have it, show them the door. What different skill sets do they bring to the table? How will they alter their marketing strategy if your home doesn’t sell quickly? Ask each for an opinion of likely sale price and therefore best list price. IMMEDIATELY throw out the high one. Seriously! Don’t get sucked in to overpricing your home by a realtor that just wants another listing in their inventory and will tell you what you want to hear. If you hear what you want to hear, consider that a big red flag. Don’t necessarily choose the realtor that you “like” best. The goal here isn’t to make a life-long friend, it is to sell your house, for the highest price, as quickly as possible so that it is the least inconvenience to you. Modest improvement … deals but no steals … new companies sniffing around the Boulder-Longmont-Broomfield corridor … those are the words on the street. “Colorado is expected to add 10,100 jobs in 2011, with most sectors showing some growth,” according to economist Richard Wobbekind of the University of Colorado. Most area experts think that Colorado’s economy will track with the national economy and show slow, steady growth over the next year. The holidays are always a slow time for home sales, and this year was no exception. But there is some pent up demand and we are seeing that start to trickle into 2011. Approximately every other week Colorado Landmark provides detailed information on the real estate actvity in Boulder and Broomfield Counties from the past two weeks. 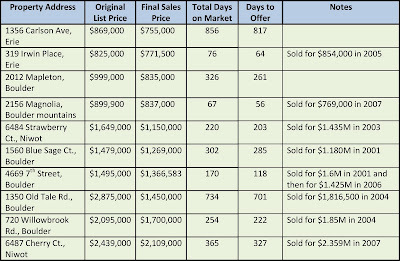 Hopefully our analysis will help reveal what properties are selling, at what prices, how long they are are taking to sell, and other relevant information about what’s going on in OUR local area – Boulder County and Broomfield County. It never ceases to amaze me that each period’s Top Ten numbers reveal an obvious trend or relevant market statistic. This period the disappointing news is that our area is definitely seeing negative appreciation in the upper price brackets. All but one of the homes in this period’s list sold for over 80% of their original asking price, which in this market actually isn’t that bad for these upper bracket price categories. The home on Old Tale sold for an embarrassing 50% of the original asking price, and it took over 700 days to do it! My guess is that if this had been priced in the $1.8-2.2M range it would have sold quicker, and the owners would not have left so much money on the table. Someone really missed the mark on that one! But the real story here is the negative appreciation. 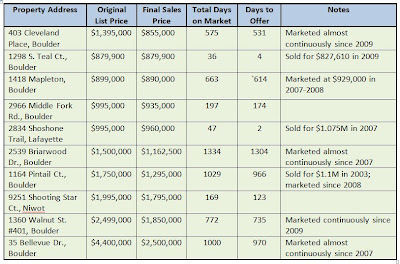 Six of the ten homes on the list sold for less this month than they did in previous years from 2003 to 2007. That time period was our boom, when buyers were scrambling to find good properties, willing to pay anything, and realtors were just taking orders. We live in a “new normal” now as one of our associates said to me the other day. Homeowners can’t assume that their housing is going to be a big money-making investment, and realtors need to provide more analysis and be willing to turn down a listing opportunity if the seller can’t be realistic about the pricing. If you know you will be somewhere for the long haul, then buy what you want, where you want. But if there is a chance your plans could change in 5 years or less, avoid the higher price points and buy something that would be more widely appealing and attainable to a larger population of buyers. Also, if you have a home priced over $700,000 you can expect the market to continue to be quite slow for a while and/or you may not recoup your original purchase price in today’s market. Some folks might even have to wait until 2014 for that. There is still a market for homes over $1M, especially in the $1-1.5M range, so if you can price your luxury home in that zone you might do well! Finally, some shameless plugs for our company … Colorado Landmark, Realtors represented buyers and sellers on 4 sides of the above 10 transactions (or 20 sides total) and we were the only company to participate in more than one transaction on this list. Also, kudos to Colorado Landmark broker associate Michelle Clifford for selling her listing at 6487 Cherry St. She priced it well and it sold for 86% of the original asking price, not bad for a property over $2M, and it sold in a year, which is to be expected for a property of this caliber and price point. Congratulations Michelle!